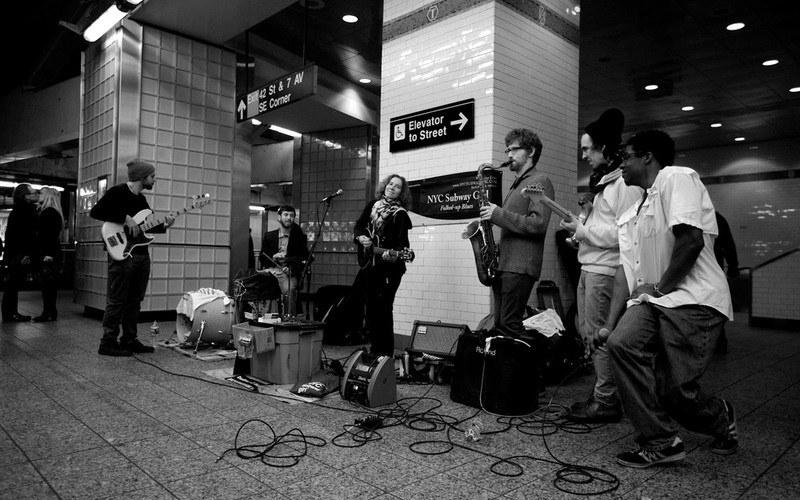 Ab + Zu are percussionists who normally perform inside a moving subway car. Personally I don't have the balance (what I call subway legs) or the lack of fear I'll impale someone with my guitar neck, so I stick to the stations. Zu commented on my Emotional Creature t-shirt (Eve Ensler's new play worth seeing). I have known Ab + Zu for many years and we are always happy to see each other, but this was the first time they actually jammed with me. I'm happy to have caught it on tape. I filmed them for my "What's Your Inspiration?" project when I was first developing it. What inspires Ab + Zu? "Good energy and positive vibes...if you embrace it, it will embrace you." every once and a while a photographer comes along and captures perfectly the experience of an underground performer. November 29th happened to be such a day. Maybe it was that odd scenario where in the midst of so many strangers, a few friends passed by at just the right moment. On rare occasions, I have the joy of a spontaneous jam with other musicians. The next group scheduled after me to perform was Music Under New York group Yes Noyes, and they happily joined in to the delight of those passing by. It's these moments captured here that show the real time life of the underground captured in split second frames. I especially like the couple kissing off to the left. by now most of our area is back to work, trains, tunnels and transit almost to 100% pre Hurricane schedules. But there are still pockets of devastation, people without power, without homes, and a sense of urgency to get back to "normal." I know it seems trivial, but today and all this week I will sing for NY and will be donating the contributions I receive to help those in need. GrowNYC/Greenmarket and local community kitchens will be providing healthy food for those affected by Hurricane Sandy and relief workers. So I will be taking the contributions to the Union Square farmers market purchasing food as an immediate way to help. I have been singing with the Music Under NY program since 1999, I sang throughout the 9-11 disaster and find comfort in being able to provide music in public spaces. Now through the contributions of commuters I have a wonderful way to help. We are in Rome now and have not seen the devastation in lower Manhattan in person, but we think that there will not be any permanent damage. the glass is solid 1.5" thick and the stainless steel fence will be fine. The only thing that could remain as evidence is the possibility of a stain on the marble mosaics. the map piece we did is all about the changing island- the same island drawn in 1640 and we over laid with the contemporary map--- climate change will also have its affect on the island, and we think seeing some of that evidence would be a good thing. you can see the water height in this picture. on a brighter note, we liked the Colbert Report moments…. I showed up at Grand Central Shuttle today and performed for a steady stream of commuters. People seemed, tired, and focused on their movement. Lots of rolling suitcases which I interpreted as flights are now back on schedule, or people were moving to their next shelter. No matter what, I could feel the energy as a sort of accepted shock, and I was glad to do my part and fill the station with song and positive vibes. I reminded people that we were all in this together and that kindness, patience and support were needed in a time like this. People were kind, generous and well if I may say so, softer. It wasn't as noisy as usual either and I found singing to be effortless. I had a nice chat with "Piano Red" who told me he had been playing on the street to a daily crowd of generous New Yorkers. I chatted with Calvin who traveled here to run in the Marathon, and although disappointed to not have run in dedication to his grandparents, he was positive, inspired. He gladly let me film him for my Inspiration Project. What Inspires Calvin? I talked with an MTA worker who had been working non stop, since last week. Nousha Salimi a wonderful photo journalist came by to capture the day and sent me some great shots. One of me and Brisdane Ford, another Music Under NY musician who sadly lost many of his possessions including his keyboard a few years ago in a fire. It was great to see him. I walked past the Public Library on my way to Grand Central. Do you know that by Thursday 55 branches were open? I applaud Tony Marx the President of NYPL for mobilizing his staff to provide not only a place for people to read books, but to charge phones, connect to the internet or meet up with friends and neighbors. To know the doors were open, this is what a great institution is all about. I hope that you and your family are safe. As our city recovers, we at The New York Public Library are working to provide essential services to New Yorkers who have been affected by Hurricane Sandy. For New Yorkers seeking reliable information, librarians have been helping patrons navigate the FEMA and Con Edison websites. We've also been providing resource and reference assistance via our Ask NYPL phone line (917-275-6975). In addition, we've waived fines and given automatic renewals to all borrowers, extending the due dates for 390,000 items. When the storm caused the cancellation of Library Lions, our annual fundraiser, NYPL decided to donate the evening's food -- enough to feed more than 600 people -- to the residents of hurricane-ravaged Staten Island. We're striving to ease the burden on New Yorkers in every way we can. and on a personal note, 57 years ago today my parents were married in NYC. Both native New Yorkers. My father who sadly died young, is remembered every day. He was a civil engineer and there are many bridges in NYC that he worked on including the Broadway Bridge across the Harlem River. My mother no longer lives in NY but enjoys the NY stories I tell in my blogs. Happy Anniversary. My building is still without power, and hoping to be back by Sunday. Since I can't be in the subway to help by singing, I can at least use this space to give info for those who might need. to hear of the journalists traveling around the city on foot, and bikes to be able to bring to us the news is heart warming. You can follow their Transit Tracker to see what commuter lines are working. runners here to volunteer their efforts to help carry water up flights to stranded residents, and other relief efforts. Now that would be power people! Here's info from the MTA regarding what commuters lines are open. unable to enjoy the luxury of sitting in front of their computer (like me) warm and cozy blogging about the tragedy. Areas devastated, South Street Seaport, Piers in Red Hook Brooklyn, Staten Island, 100,000+ homes destroyed. Where can we get food? to deliver food to the elderly. City Harvest is delivering food to soup kitchens and food pantries throughout the city. West 25th Street and Surf Ave.
Mill Rd. and New Drop Ln. Yetman Ave. and Hylan Blvd. Beach 51st Street and Rockaway Beach Blvd. Red Fern Ave. and Beach 12th St.
Beach 84th Street and Rockaway Beach Blvd. Vernon Blvd. and 30th Rd. Where can we get ice? ConEd is keeping a list of distribution centers in each borough where wet and dry ice are being distributed. Queens (dry ice) - 121-10 Rockaway Blvd. Manhattan (wet ice) - Union Square Park, Union Square East and East 17th Street. during this critical time. Many of the most impacted neighborhoods are those with the fewest resources already. Subway service will be limited Thursday, due to ongoing water remediation, infrastructure repairs and power related problems. Limited service will operate along parts of several routes between The Bronx, Upper Manhattan and Midtown. Other lines will run in parts of Queens and Brooklyn, with service terminating in Downtown Brooklyn. Shuttle Bus service will be available at Jay St - MetroTech, Atlantic Ave - Barclays Center and Hewes St in Williamsburg to 57th St and Lexington Ave in Midtown Manhattan. See Bus Stops in Manhattan. The restoration of subway service was made possible by the hard work of hundreds of Transit Workers who inspected miles of track, removing debris that washed into the system, dried out components and made necessary repairs. In other parts of the system heavy duty pump trains continue to evacuate thousands of gallons of water that filled 7 underwater tunnels. Station Environment crews removed and repaired canopies on elevated stations ripped off by Sandy's strong gusts, while cleaners removed debris. Track Workers checked rails for damage while Signal Maintainers inspected and tested equipment that was submerged under water. Electronic Mchecked critical electrical systems, including crucial communications equipment. Late Wednesday night, the system was energized and 3rd Rail power was restored. During the night crews will begin running trains throughout the system to polish rials and ensure there are no track or other component defects before service begins. Because subway service will be limited to roughly half of the system's subway lines, waits will be longer and trains will be more crowded. Customers are advised to consider changing their normal routines to travel later in the morning or later in the evening. Bus service will be operating on a near normal weekday schedule. Some routes may be operating with minor detours due to street conditions, customers are advised to look for signage at bus stops. Customers should also expect longer waits and crowded conditions. 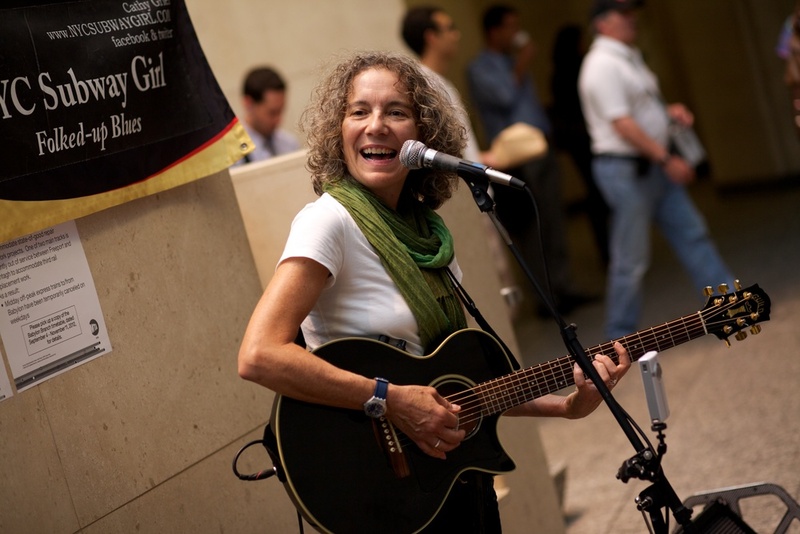 I travel to South Ferry regularly as I perform in the Station and in the nearby Staten Island Ferry terminals. It is so sad to realize this newly designed station only open for 2 years, is now under water. I had the wonderful opportunity to be invited to perform in the station as part of the opening celebration on March 8, 2010, showcasing the gorgeous art of the Doug and Mike Starn designed for the MTA's Arts For Transit program. I know it will be back soon, and appreciate the amazing work of all those helping us to recover after the storm. Here's a funky clip of me on the opening day. And a clip of the submerged station from the MTA youtube channel. Very chilling to see. At least some kids in the upper east side were able to get out and enjoy some normal fun amidst the craziness of the storm devastation. Thanks Katie for sending me a picture of these kids who were out at 70th and Park (Katie had to walk to midtown from 86th st to get to work). Every hour I seem to think of someone else that I know whom I haven't heard from. I send an email, funny how we've arrived at the point where no one has a land line. The few I know who do still have one, it's hard to get through, the line just beeps a busy signal. Or the circuits are busy. This storm, (and I am somehow irritated by announcers who call it "Super Storm Sandy" sounds way too cute and slick, has affected me not unlike September 11. I can't ever equate the tragedy and loss of life, the panic, the hour of that day to this storm, but there is something in my personal human condition that is overtaken by the event. Sure I've cancelled all my gigs this week, I'm privileged to have another home to escape to, and am with power while my own apartment building has been dark since 9pm on Sunday night. This is the inconvenient catastrophe and the longer it goes on the bigger the issues. For many it's the lack of water, a hot meal, any possible way of getting to work besides on foot if there is even a work to go to. Many friends have offices flooded or still without power. Food supplies are drying up fast. How long can you go without flushing a toilet? When will if ever the salt water contamination be cleaned form the subway station. I personally have lost my place of work, my public stage in the NYC subway and main train terminal stations. I am scheduled to perform in Grand Central tomorrow. I don't know how I can get there. Trains along the Hudson and Harlem lines are limited, traffic will be insane. All I can say New Yorkers is I'll be back as soon as I'm able. No elec chez toi? We had 2 weeks without elec, heating in Paris last Feb. Our area and apartment building was really bad then. No hot water, no light for many many days. It was horrible. So I know what you're going through. We're all so used to comfort that it's hard to deal without it and are lost when the unexpected hits us so suddenly. Take care! Thanks Sabine, the message here is NYers take heart and be safe. I'll keep posting and will let you know when it's safe to peform in the underground of the city I love! In the meanwhile here's a link to MTA for any transport information. and why not check out some of my Inspiration Project clips and see why NYC is so special. If your apartment is still without power, please make sure to knock on the door of your neighbors and check in. Especially the elderly need to be heard from. Grand Central Terminal and all outlying Metro-North station buildings will remain closed. as of 2pm this afternoon some light rail in NJ an some Metro-North lines are working. I created a video about my experience performing in public spaces for a concert I gave at the Hudson Opera House this past June. I included it in my August 8th show at Joe's Pub in NYC. Peter Biskind executive director of FilmColumbia was in the audience and asked to put it in this years festival. FilmColumbia is a wonderful film festival in Chatham, NY. It might be a small town, but thanks to a wonderful community filled with film buffs and many professionals in the cinema world, we are thrilled each October to see firsthand some of the best films to be released throughout the coming year. I enjoyed watching my film "Inspirations From The Underground" to a packed Crandell Theatre on opening night before the new Dustin Hoffman directed film "Quartet." Funny how after decades of being on stage and only a few years of making video for my website I would be in a movie theatre watching myself up on the big screen. It was quite a thrill. The film is a short about the story of my life as a performer in the underground of NYC and the people I meet. My first performance back from my summer break was at Columbus Circle, uptown 1 platform. This spot is great. The crowd builds in between trains, but it's also quite noisy with express trains passing in both directions on the inside tracks. I learn how to pause to save my voice. When the train arrives and the doors open, I love to see people inside look out in my direction, seemingly surprised to hear live music. I see a lot from my vantage point where I set up, and the colorful Sol Lewitt mosaics are behind me. I met photo journalist Nousha Salimi who discovered my website and found where I was playing. She came to my gig the following day where I performed in Brooklyn at the LIRR station. It was interesting to have Nousha spend the entire gig with me 2 days in a row and each of the locations couldn't be any more different. To be able to see what I witness, the humanity, the intense experience of being in one location for 3 hours at a time, while everything and everyone else is speeding by on their way to somewhere. I grew up believing in the power of the microphone and having some inner need to be aware and socially conscious. Sure I had public school teachers inspired by the Vietnam War and Civil Rights movement to urge me to think. And as a singer -songwriter I was deeply influenced by the work of Pete Seeger, Phil Ochs, Odetta, Joni Mitchell, Bob Dylan, Joan Baez, ...and I could go on. The Occupy Wall Street gatherings in Zuccotti Park in lower Manhattan that began last September 17th and grew to a movement inspired me. To witness something shifting, something to cling our anxiety, frustration and disbelief to. How could we arrive at such a historical economic crash and continue to allow corporations and organizations to have unfettered access to funds without oversight, tossing regulations aside, allowing greed to override "right action" in the name of profit and "free-market driven policy"? The "We Are The 1%" mantra stuck. I went to Zuccotti Park many times over the months including before and after the NYPD raid that shut the park down. I sang Amazing Grace with a small crowd standing in the rain, surrounded by barriers and showing a stamina and resolve to continue the fight for justice that I hadn't seen since my youth. Today I am mindful of the anniversary and how it is not the celebration of the past year so much as it is looking forward to how the next days, months and years will unfold. Performed at Graybar corridor today at Grand Central station. Easy going gig at this spot, but hot, not insane but hot. I usually don't like to play when it's too hot and usually that means during the month of August. But I was also enjoying running through my set I'd be playing on Wednesday at Joe's Pub so it was a good practice run. A family from South Carolina came up to me, young girls with smiley face t-shirts that said Hi on the front and Bye on the back. I made a song up about it and they enjoyed it. I asked if they would let me film them for my inspiration project. Their inspiration "Jesus Christ." Up from the stairwell came 2 kitted out terror squad police officers: helmets, huge guns, flank jackets and all in black. I'm used to seeing military and police presence in the stations, although I don't like that it is something to get used to. I had just finished singing Willie Nile's song One Guitar "I'm a soldier marching in the army got no gun to shoot, all I got is one guitar…." and in the middle of my song Question of Desire when the cops came up the stairs, one of them with his serious demeanor actually air guitar-ed his gun! It was priceless. I caught him in the act and smiling said "now that's what it should be used for, right?!" Wednesday August 8th 7pm, Joe's Pub, Public theatre425 Lafayette St. A wonderful club with great sound and a newly redesigned space (with food) tickets $15 order onlineor call 212-967-7555 the last time I played Joe's Pub was in 2010 and it sold out! Here's a clip I recently put together to show a bit of my underground world. June was an exciting month underground. I've had fun spontaneous encounters with some truly amazing above ground musicians you may have heard of. Vocalist, percussionist Vicki Randle in town performing with Mavis Staples. Local Broadway wunderkind Jim Abbott, musical director to the stars. And the musically exotic Helga Davis, host of WNYC and WQXR "Overnight Music"
I'm thrilled to have gotten some "What's Your Inspiration?" comments from them. What inspires Helga? "Beauty and music." inside you, it makes an emotion in me..."
Also I was featured in an article recently by writer Laura Hankin of Galo Magazine. 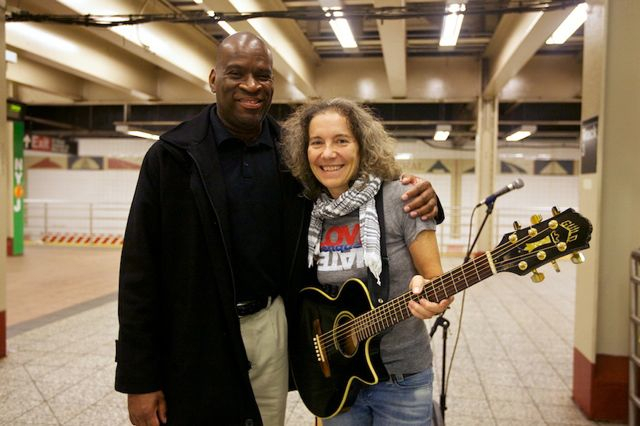 "Female Subway Musicians A Rarity"